We're taking most of our team to the St. Louis, Missouri, edition of the No Fluff Just Stuff 2008 tour. This will be my first actual NFJS event. I attended the Spring Experience in 2007, which was put on by the NFJS guys, so I expect this event in St. Louis to be great. Since we're based in Memphis, St. Louis is only about a 4 1/2 hour drive. We're all going to pile in a van and road trip. It should be a great time. I'm going to have a hard time choosing sessions: Neal Ford, Scott Davis, David Geary, Jeff Brown, and Bryan Sletten all have sessions that I'd like to attend, several of which are in conflict. I hope they do post-conference video delivery of these sessions just like they're doing for the Spring Experience. If anyone's going to be there, let's do dinner one night and you can meet some of the St. Jude team. So yesterday I was attempting to debug an issue in a batch processing module within one of our applications. In short, an assertion was failing deep within Hibernate as it attempted to flush the session. Using a combination of various log statements, I had isolated the problem down to a particular record that the batch process was attempting to update. (BTW: I know you shouldn't be using Hibernate for batch processing - however, we're talking about batches of at most 1000 records here, not millions!) What I really wanted to do was set a breakpoint and examine the state of the objects at runtime; however, I dreaded the thought of clicking through the breakpoint time and time again until I got to the particular record that was causing the problem. "Surely," I thought, "there must be a way to tell the debugger to only break under certain conditions." Enter the desired conditions and voila! 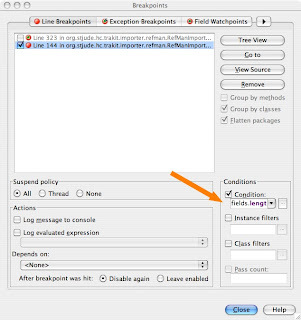 A conditional breakpoint. It worked like a charm the very first time, and I only had to inspect the breakpoint when the problematic record came up. 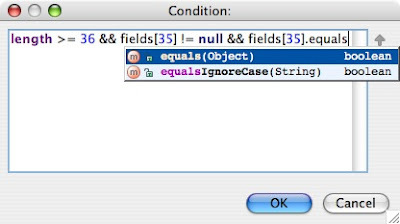 Another nice feature of the conditional breakpoint is that if some sort of exception (such as a NullPointerException) occurs while attempting to evaluate the conditional expression, IDEA pops up a dialog informing you what happened and asking if you want to stop at the breakpoint or continue. Nice. and it will automatically be pretty printed. The Spring Experience 2007 - Videos on the way! There were several sessions that I wanted to attend that I couldn't - now I get to attend...and write! Look forward to some more reviews from The Spring Experience 2007 in the coming weeks!